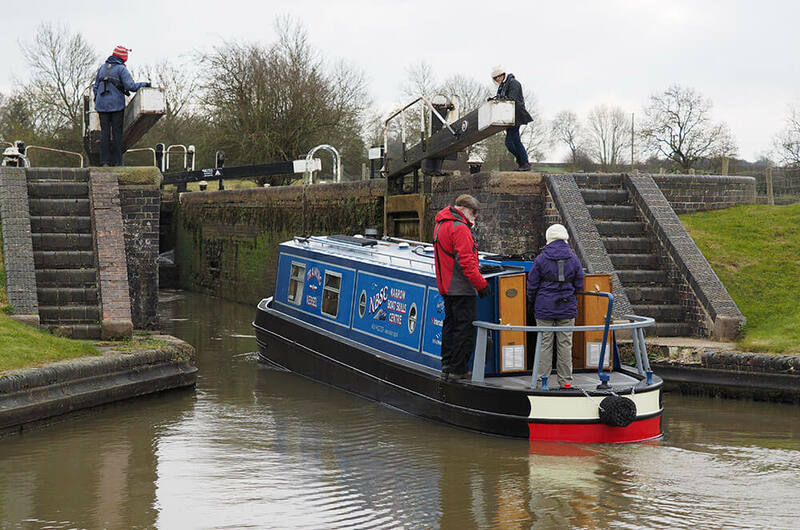 The RYA Inland Waterways Helmsmans Course is for those new to boating or those boaters who feel that they need to brush up on their helmsmans skills. Our courses are run on our dedicated training boat the Gwendoline May although we can run a course on your own boat*. As an RYA recognised training centre, the helmsman’s course follows the RYA syllabus and participants are awarded an Inland Waterways Helmsman’s Certificate upon successful completion. We run scheduled courses throughout the month but if you are booking for 2 or three persons at the same time we will run a course at a time to suit you. For operational reasons there are no more than 3 students on any course. It is a highly practical course with the majority of the day spent out on the water or on the bank mooring up or working locks. As such it is important that you have suitable clothes (including wet weather gear) and sturdy non slip shoes (no flip flops or sandals). It is also recommended that you bring a hat in the unlikely event that the sun is shining. Lifejackets are provided and wearing them is mandatory. We provide hot and cold drinks throughout the day as well as lunch. If you have any special dietary requirements please speak to us before the course so that we can accommodate you. Our cruising route will include wide locks, tunnels, bridges, a small aqueduct and optionally swing bridges. We can if desired include the incredible Foxton Locks. *Our training vessel, the Gwendoline May, is configured specifically for training and we would suggest that wherever possible you take your course on our boat. 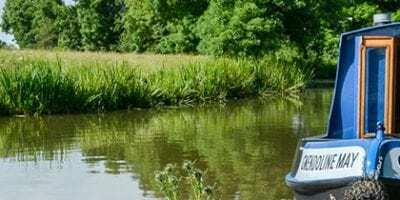 However we realise that for a number of reasons (location, special access requirements or even personal preference) you may want to use your own boat for the course and we are happy to accommodate you. For preference your boat should either be cruiser stern or semi trad. If it is a traditional stern boat we can only have one helmsman on the counter at one time which restricts teaching. We will provide sufficient lifejackets for the course but it is your responsibility to ensure that other equipment (mooring lines, piling hooks/chains, mooring spikes etc) is available. It is also important that you are near at least one lock. 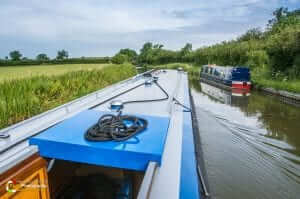 If we run a course on your boat from our base at Debdale there is no additional cost. If we run a course on your boat at a different location there is a fixed £40 cost to cover all travel and accommodation costs we might incur. Please contact us to discuss further. It was all brilliant – comprehensive, informative practical and enjoyable. Its great we get to try a bit of everything. Steve was very patient and helpful, and a great source of knowledge! A revelation - my retirement plans might need re-doing now. I'm a convert to the Inland Waterways. Outstanding course. Great experience, well delivered. Thank you. I was very lucky to have the first day of the course all to myself which meant I got lots of support to boost my confidence for the harder parts to follow on the second day. Steve was patient and kind. He made me feel confident and was able to explain everything so that I understood it, thank you. The food was delicious - I really liked the cold drinks (it was very hot). I really enjoyed the course and can't wait to perfect the skills learnt on my next holiday. 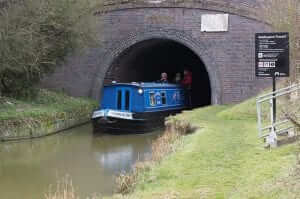 Ideal Location – lots of different training opportunities (tunnel, Locks, winding holes etc. ), in idyllic scenery. Friendly instructive teaching. Very hands on, clear instructions, very enjoyable. The course is what we needed tp have the confidence to enjoy boating. Lots of detail explained very clearly. Enjoyed every moment. Lovely to have such a calm instructor - felt relaxed enough to let go of any anxieties, as a newbie! Great that the tutor is both an experienced narrowboater and a proper engineer! Lovely lunch too! A very enjoyable course and left me feeling well prepared for two weeks afloat in September. We very much enjoyed the company of the instructor. An informative course with lots of practical work. I particularly appreciated the personal tuition when dealing with more difficult exercises. Friendly, knowledgeable instructors who took the time to teach. Very friendly very professional. Wholly enjoyable way to learn! Probably one of the best courses I have been on. Thanks again!